Tags: 'My wife', Dan Brown, Jesus said to them, The Da Vinci Code, The Gospel of Jesus' Wife, Was Jesus Married? “I beg your pardon?” Sophie’s eyes moved to Langdon and then back to Teabing. “It’s a matter of historical record,” Teabing said, “and Da Vinci was certainly aware of that fact” (Dan Brown, The Da Vinci Code, 244). A little less than a decade ago, Dan Brown’s controversial book The Da Vinci Code rocked western culture. Seemingly everywhere I went, people were carrying the book, sneaking a peek whenever they could. Churches warned their congregants against reading it, which made me want to read it all the more. Finally, I decided to indulge in the forbidden fruit and I LOVED IT!—despite its many flaws and shortcomings. Within the first few pages, I could tell Brown had an ax to grind with the Catholic Church and the Christian faith. Having studied Gnosticism in graduate school, I was surprised by the extent Brown sought to deliberately twist the facts. The plot of the Da Vinci Code (if you were one of the few who didn’t read it) surrounds the existence of a modern-day descendent of Jesus, who was allegedly married to Mary Magdalene. The book, which was categorized fiction in library bookshelves, undermined the faith of many Christians. People struggled with the idea of placing their trust in a man who was married and possibly wasn’t even God. Finally, the hullaballoo died down and life returned to (ab)normal…until this week. Since then, news sites have once again stirred the pot, proposing the idea that Jesus was married. Nevertheless, media outlets trumpeted the report, manipulating the facts about as loosely as well as…well, Dan Brown did a decade ago. So, does the fragment offer any proof that Jesus was married? It does say “Jesus said to them, ‘My wife …” doesn’t it? It just isn’t old enough. 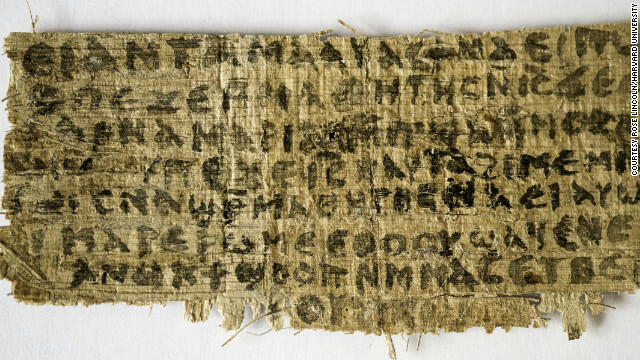 Papyrologists speculate that the fragment was written in the fourth century AD. That’s old, but not quite old enough in my opinion. Amidst the thousands of early documents referring to Jesus, one surfaces three hundred years after his time on earth, and we’re supposed to believe that one over the many others? Fiction Novels About Jesus Were Common. At the same time, fictional depictions of Jesus’ life were legion in the centuries following Jesus’ ministry on earth. How do we know that someone wasn’t writing a very fictional account of Jesus? We must not live like the Pharisees in Jesus’ time. “You are white-washed tombs,” Jesus said to them. My wife says the Pharisees were dead before they ever lived. Without punctuation and context, we really aren’t sure what the writer is saying. Did you read that? In all likelihood, Jesus was talking about his dear old mom! Every so often, books, blogs or news reports announce “startling” evidence that undermines the faith of well-meaning people. But a faith built on a fiction novel or a news headline is shaky at best. Before jumping to conclusions, let’s wait for the truth to emerge and remember that our foundation is much sturdier.